3 Passenger's side front reading lamp The reading lights can be switched on or off by pressing buttons 1 or 3. The courtesy lighting (including footwell lighting) can be turned on or off by pressing button 2. This also activates the automatic function. 5 Passenger's side rear reading light The rear reading lights can be switched on and off by pressing buttons (4) or (5). The reading lights and courtesy lights will switch off automatically approximately 10 minutes after the engine has been turned off. The lights can be turned off sooner by pressing the respective buttons. • The vehicle is locked from the outside with the remote key or key blade. The automatic function can be disconnected by pressing button (2) for more than 3 seconds. Briefly pressing the button again automatically reconnects the function. The courtesy light timer periods can be changed. 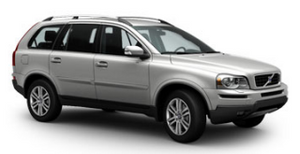 Contact a trained and qualified Volvo service technician.